The 103rd Tour de France is set to take place this July with an exciting new route that will test the riders to their limits once again. If you want to be roadside to experience the action this year here’s our guide to the main regions on the route, and what you can see or do when the peleton leaves town. The race begins in Normandy this year with a majestic start at Mont Saint Michel on Saturday 2nd July. Stages 1 to 3 explore the Manche region covering almost 600km of flat racing. As well as Mont Saint Michel the route takes in Utah Beach, a major site involved in the D-day landings of WW2, the historic cities of Angers and Cherbourg-en-Cotentin, and the stylish resort of Granville. This is one of the easiest parts of France to reach from the UK with ferries into Cherbourg and St Malo giving fast access to the region. Normandy is a wonderful place to visit for a family holiday or break with friends. The coastline and countryside are perfect for active water sports, hiking and, of course, cycling and there are plenty of historically important sites to discover. Take a short break or week away here during Le Tour or make a stopover on your way to a summer holiday further into France. Book a holiday cottage or B&B with us and get 20% off your ferry crossing. The next three stages see the riders journeying south down the western side of France though the Haute Vienne with flat open roads and beautiful scenery. A series of climbs heading to the ski resort of Le Lioran adds to the excitement. The west of France is a great place for a summer break. The coast is perfect for surfing and watersports and you are near some of France’s best tourist attractions and theme parks including Puy du Fou, Futuroscope and the Lascaux caves. Enjoy delicious local food and wine, visit cultural hotspot Bordeaux and relax in the sunny climate – a villa with a pool is the perfect place to stay. Poitou Charentes, Limousin and Aquitaine are all great choices if you want to make a day trip from your holiday home to see Le Tour pass by. Find a villa or gite near the route. The first serious mountains of the tour appear in these stages at the Spanish border and the route detours into Spain and Andorra as it snakes through the Pyrenees. Gruelling climbs and speeding descents make thrilling viewing and the spectacular mountain scenery is a splendid backdrop to the action. Stay at a cottage or villa in the region with a group of friends and get active with climbing, hiking and mountain bike trails before relaxing in the sun by the pool. It’s a great foodie destination too; you could even enjoy a gastronomic trip to San Sebastian in Spain as part of your French holiday. We’ve got a great selection of property in the region, why not have a browse to discover your perfect holiday home? 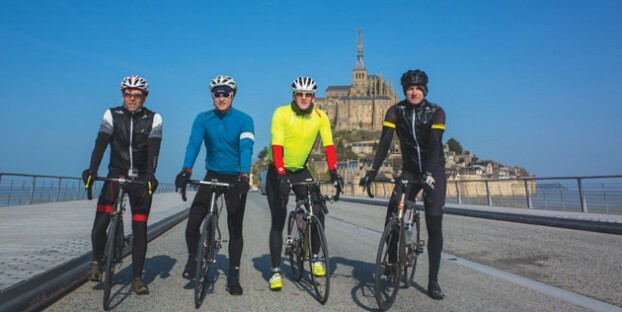 From July 13th the Tour heads across the South of France from the gorgeous historic city of Carcassonne through Montpellier and Mont Ventoux. The first individual time trial stage takes place on the dramatic road overlooking the Gorges de l’Ardeche and finishes at the incredible Caverne du Pont-d’Arc with its ancient cave paintings. A holiday in the Languedoc-Roussillion region near this part of the 2016 Tour de France would also allow you to visit the historic Roman sites at Arles and Avignon and put you close to the beautiful Mediterranean coast. The next five stages twist over the mountains and take Le Tour into Switzerland to the city of Berne. The most fearsome climbs include Grand Colombier in the Jura Massif and Mont Bisanne, Col de la Ramez and Col de Joux Plane in the Alps. The winners could be decided on the final downhill stage into Morzine which should make for a nailbiting finish of Stage 20. Fabulous views of Mont Blanc and panoramic vistas make this one of the most dramatic sections of the race. Choose a chalet in the mountains and soak up the atmosphere as the Tour reaches fever pitch during these important and difficult final stages! As usual the grand finale of the Tour takes the triumphant riders down the famous Champs Elysées in Paris. The finale takes place on Sunday 24th July and even if you can’t be there in Paris you can still enjoy the atmosphere; every bar in every town and village in France will be tuned in for all the action!